Scotty and a handful of his classmates are the last students left at school when the catastrophic nor’easter blows in and classes are canceled. No big deal, they think, surely someone will be by to pick them up soon. 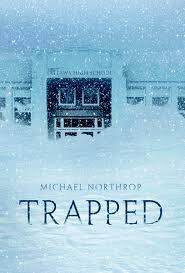 Unfortunately, that’s not the case: the students fatally underestimated the storm and end up trapped at school. What they assume is going to be a single night spent adventure-style in their high school stretches nearly a week, as the snow simply does not let up. Now they have more to worry about than just being cold: the weight of the snow threatens to collapse the roof. One of the boys makes a heroic decision, but I won’t spoil the ending for you. This is a very fast read, a true escapist book. I finished it in a few hours, speeding along, caught up in the adventure. There are some interesting conflicts between the characters, and the state of emergency feel to the book is captivating. Highlights of the story include a character who turns out to be an adept lock-picker, breaking into the school cafeteria for the others, and the students building a fire in one of the classrooms. It’s a good book to read when you’re nice and warm inside. Northrop, Michael. Trapped. New York: Scholastic Press, 2011. 232 pp. Ages 13-16. Posted on May 4, 2011 by ShannaPosted in Adventure, Realistic Fiction, YA LitTagged basketball, blizzard, emergency, high school, snowed in.